A blessed feast of the Presentation to all our readers, which used to be, and in some places still is, termed Candlemas, a celebration of the light that is Christ, now revealed to the world, the Lumen gentium. outside of Whom there is only darkness. In the pre-1969 calendar, this day marks the end of the Christmas season, and the beginning of Christ’s public life, after the forty days purification of Our Lady. 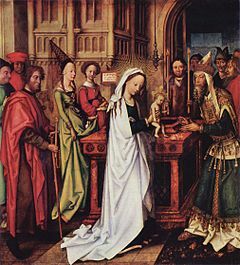 The Presentation is Christ’s first public appearance, one which would be repeated in a different key twelve years later in the finding in the Temple; then, after eighteen or so years of hidden life in Nazareth, with His vigorous cleansing of the same Temple. Pope John Paul II connected this feast particularly with religious vows and consecrated life, with the soul dedicating itself to God, in which we all share, through our Baptismal promises, renewed at Confirmation: We are all called to be witnesses for the Truth, martyrs, in some sense, signs that will be contradicted. As darkness washes over the face of the earth, and the faith retreats like the tide, we must become more intentional in our Faith, and cling more closely to Christ, His battered Church, His sacraments, His people, and bring as many as we can through that witness into the fold. (See Paula Adamick’s vivid words on the need for such witness in defending life). One way to do that – at least to bolster our own devotion – is through music, and I would highly recommend two Bach cantatas composed for this feast, Mit Fried und Freud ich fahr dahin, ‘With peace and joy I now depart’, originally a hymn by Martin Luther, based on the Nunc Dimittis, the Gospel canticle of Simeon sung at Compline, which Luther would have recited each night in his days as an Augustinian monk. Bach would take such hymns, and harmonize them into complex polyphonies that only his genius could accomplish. There is also Ich habe genug – I have enough – composed originally by Bach himself, one which seems to have been a favourite of his, and one of the most often performed and recorded of his cantatas in modern times. The opening oboe obbligato is nearly unsurpassed in its melodic expressiveness. The Lutherans, after their divergence from Catholicism, kept a strong devotion to Our Lady, and Bach himself composed much in honour of the Mother of God (immerse yourself also in his incomparable Magnificat). Of course, there is much explicitly Catholic music as well – from Palestrina to Vivaldi and Mozart and countless others – but I mention these, perhaps, to show that we, as the ‘universal’ Church, reject nothing that is true, good and beautiful, and, in light of the week of Christian unity and this feast of Christ’s revelation to all men, we should ponder music as one of the most ecumenical of endeavours, a universal language that speaks to the heart. We might imagine Simeon himself singing his canticle, now made ready to depart in peace to meet his God whom he had served so well. Would that we could all say – or sing – the same when our own final dismissal draws near. Previous articlePro-Life… Is It Working?